Amid the mind-numbing onslaught of commercials for California ballot measures in the weeks leading up to Election Day, there wasn’t a single one from the plastic-bag industry. Bag makers spent $3.2 million to put a referendum on the ballot, Proposition 67, that would invalidate a statewide ban on single-use grocery sacks – an effort to protect their $145 million-a-year business in the California.But when it came down the homestretch, the industry went silent. They had spent $3 million on campaigning after they qualified the measure and the companion, Proposition 65, but had no ads, mailers, commercial, phone banks or other paid voter outreach efforts in the two months before the election, according to campaign finance filings. “I am not ungrateful,” quipped ban proponent Mark Murphy, executive director of Californians Against Waste, which opposed the measure. Voters approved the ban, 52.5 percent to 47.5 percent, as of Thursday’s tallies. In other words, it wasn’t a blowout. So what happened to a final push from the plastic bag industry – a push Murphy acknowledged would have made the results much closer? With the tobacco, pharmaceutical and medical industries each spending tens of millions to protect their interests on the ballot, where was the plastic bag spending? Jon Berrier, spokesman for the American Progressive Bag Alliance, said the industry had no comment beyond a prepared statement that said voters made a mistake on Election Day and why bag makers thought so. Murphy thinks the industry believed it was a lost cause and decided not to throw good money after bad. He points to polling that may have dissuaded the industry from spending more money. A poll commissioned by the industry, posted online Sept. 7, showed Prop. 67 trailing 58 percent to 36 percent, with the rest undecided. By qualifying Proposition 67 for the ballot, the bag industry forced postponement of the ban put in place by the state Legislature from its scheduled start date of July 1, 2015 until the day after Election Day.By doing so, they bought themselves an extra 16 months of selling bags. Estimates from the industry and environmentalists range from 12 billion to 12.4 billion plastic bags being sold to retailers during that 16 months, about 80 percent of which would not have been sold if the ban had been in place. At a cost of 1 1/2 cents per bag, and using the industry’s estimate that they make a 5-percent profit, the industry would have cleared between $7 million and $7.5 million in profit for that extra 16 months. That means they had a net gain because of the referendum. The extra 16 months netted them more more profit than the $6.2 million spent to qualify and promote Props. 65 and 67.Opponents, meanwhile, spent $3.7 million, according to the calculations of Ballotpedia. Opponents spent nothing on Prop. 65, which the plastic bag industry also put on the ballot. 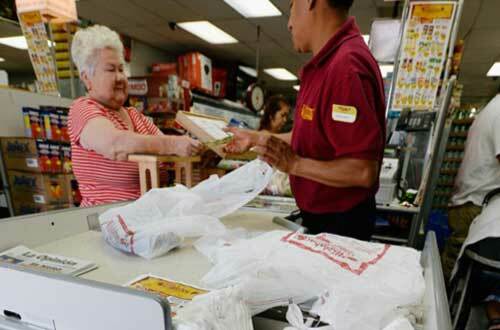 The measure called for all revenue from the sale of 10-cent paper carryout bags to go into environmental funds, with plastic bag proponents claiming the ban was a ploy by grocers to increase profits by boosting the sales of paper bags. Grocers, some of whom help fund opposition to Prop. 67, disputed that claim, saying they simply wanted a uniform law throughout the state rather than a patchwork of varying local laws. Activists complained that the plastic bag industry – most of which is based out-of-state – was trying to undercut environmental efforts with Prop. 67. But Murray said the ballot measure raised the profile of California’s bag ban, and the ban’s success is likely to empower other states to follow suit. While there are cities and counties through the nation with bans, California is the only place with a statewide ban. “The vote sent a message,” he said. “I could not have purchased the kind of publicity this gave us. The plastic-bag industry may come to see that their strategy backfired.”Murray estimated that next year there would be efforts at statewide bans in a dozen states.